Glory RBG-300 Cash Recycler - Technology Unlimited, Inc.Technology Unlimited, Inc.
developed and advanced functions which not only enable the centralization and management of the cash maintained in the store but also to fulfill the needs of the cash processing of back office. 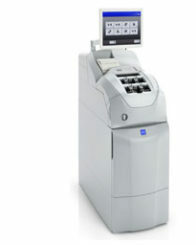 The RBG-300 reduces operational processing time and alleviates the requirement for store staff to handle cash, helping to create a perfect environment to focus more on customer service and sales. Centralize cash management: Depositing and counting operations such as collecting the sales proceeds of each cashier and preparing floats (change) are considerably alleviated and enable centralized cash management of the store. Central control of all store inventories are also available by integrating the network system with Headquarter/Bank. Recycle function: The cash recycling system allows the use of deposited banknotes for withdrawal. This helps to minimize cash maintained in the store, resulting in an enhancement of security. Only banknotes in good condition are recycled, therefore contributing to a reduced jam rate. Collection box: Non-recyclable notes (Unfit notes) and excess cash are stored in the collection box. This effectively contributes to a simplified and improved collection process. High capacity: A total capacity of maximum 14,400 pcs, reduces the frequency of the collection process and helps to save operational time. By reducing manual cash handling, security can be strengthened and controlled more stringently. Auto verification function: Cash contained in the cassette is counted regularly and reconciled with the balance data, and auto verification is implemented at the time of jam occurrence. Therefore reconciliation of actual inventory of the machine and the balance data is ensured at all times, enhancing the efficiency of the verification process. Denomination cassettes: Different denominations can be set by each recycle cassette. Unrecognized denominations are stored in the collection box for the efficient use of the recycle cassettes. The recycle cassettes are also removable. By simply replacing the cassette in question, the downtime of the machine can be kept to a minimum.